Hull City Association Football Club is a professional football club in Hull, East Riding of Yorkshire, England. Founded in 1904, the club plays in the Championship, the second tier of English football. In 2007–08, they achieved promotion to the top flight of English football for the first time in their history by winning the Championship play-off Final at Wembley Stadium. Their highest league finish was in 2013–14, when they finished 16th in the table, a season in which they also reached the final of the FA Cup. Hull City play home games at the KCOM Stadium, having moved there in 2002 after 56 seasons at Boothferry Park. Hull traditionally play in black and amber, often with a striped shirt design, hence their nickname, The Tigers. 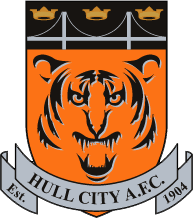 Further information: History of Hull City A.F.C. For a statistical breakdown by season, see List of Hull City A.F.C. seasons. Hull City and Grimsby Town were the only two professional teams which had official permission to play league football on Christmas Day because of the demands of the fish trade, but that tradition has now disappeared following the dramatic reduction of their trawler fleets in recent years. The following season[when?] a new ground was built for Hull City across the road from the cricket ground. Still under the managership of Ambrose Langley, Hull continued to finish consistently in the top half of the table. They came close to promotion in the 1909–10 season, recording what would be their highest finish until they matched it in 2008. Hull finished third, level on points with second placed Oldham Athletic, missing promotion on goal average by 0.29 of a goal. Hull regularly finished in the top half of the table before the First World War, but after the war the team finished in the bottom half in seven seasons out of eleven, culminating in relegation to the Third Division North in 1930. Hull reached the Second Division in 1985 under player-manager Brian Horton. They remained there for the next six years before finally going down in 1991, by which time the club's manager was Terry Dolan. Hull finished 14th in the Third Division in the 1991–92 season, meaning that they would be competing in the new Second Division the following season. In their first season in the rebranded division, Hull narrowly avoided another relegation, but the board kept faith in Dolan and over the next two seasons they achieved mid-table finishes. Financial difficulties hampered City's progress, as key players such as Alan Fettis and Dean Windass had to be sold to fend off winding-up orders. In the 1995–96 season Hull were relegated to the Third Division. In 1997 the club was purchased by former tennis player David Lloyd, who sacked Dolan as manager and replaced him with Mark Hateley after Hull could only finish in 17th place in the table. Hull's league form was steadily deteriorating to the point that relegation to the Football Conference was looking a real possibility. Lloyd sold the club in November 1998 to a South Yorkshire-based consortium, but retained ownership of Boothferry Park. Hateley departed in November 1998, with the club at the foot of the table. He was replaced by 34-year-old veteran player Warren Joyce, who steered the club to safety with games to spare. Hull City fans refer to this season as "The Great Escape". Despite this feat, Joyce was replaced in April 2000 by the more experienced Brian Little. Despite briefly being locked out of Boothferry Park by bailiffs and facing the possibility of liquidation, Hull qualified for the Third Division play-offs in the 2000–01 season, losing in the semi-finals to Leyton Orient. A boardroom takeover by former Leeds United commercial director Adam Pearson had eased the club's precarious financial situation and all fears of closure were banished. The new chairman ploughed funds into the club, allowing Little to rebuild the team. Hull occupied the Third Division promotion and play-off places for much of the 2001–02 season, but Little departed two months before the end of the season and Hull slipped to 11th place under his successor Jan Mølby. Hull began the 2002–03 season with a number of defeats, which saw relegation look more likely than promotion, and Mølby was sacked in October as Hull languished fifth from bottom in the league. Peter Taylor was named as Hull's new manager and in December 2002, just two months after his appointment, Hull relocated to the new 25,400-seater KC Stadium after 56 years at Boothferry Park. At the end of the season Hull finished 13th. Hull were Third Division runners-up in 2003–04 and League One runners-up in 2004–05; these back-to-back promotions took them into the Championship, the second tier of English football. 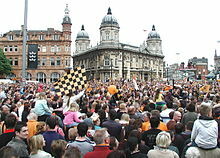 The 2005–06 season, the club's first back in the second tier, saw Hull finish in 18th place, 10 points clear of relegation and their highest league finish for 16 years. However, Taylor left the club to take up the manager's job at Crystal Palace and Colchester United's Phil Parkinson was confirmed as his replacement, but was sacked on 4 December 2006 with Hull in the relegation zone, despite having spent over £2 million on players during the summer. Phil Brown took over as caretaker manager, and took over permanently in January 2007, having taken Hull out of the relegation zone. Brown brought veteran striker Dean Windass back to his hometown club on loan from Bradford City, and his eight goals helped secure Hull's Championship status as they finished in 21st place. Adam Pearson sold the club to a consortium led by Paul Duffen in June 2007, stating that he "had taken the club as far as I could", and would have to relinquish control in order to attract "really significant finance into the club". 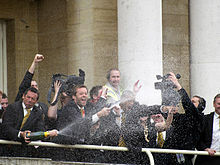 Under Paul Duffen and manager Phil Brown, Hull City improved greatly on their relegation battle of 2006–07 and qualified for the play-offs after finishing the season in third place. They beat Watford 6–1 on aggregate in the semi-finals and played Bristol City in the final on 24 May 2008, which Hull won 1–0 at Wembley Stadium, with Hull native Dean Windass scoring the winning goal. Their ascent from the bottom division of the Football League to the top division of English football in just five seasons is the third-fastest ever. Despite being one of the favourites for relegation in the 2008–09 season, Hull began life in the Premier League by beating Fulham 2–1 on the opening day in their first ever top flight fixture. With only one defeat in their opening nine games, including away wins at Arsenal and Tottenham Hotspur, Hull City found themselves (temporarily) joint-top of the Premier League table on points (third on goal difference), following a 3–0 victory over West Bromwich Albion – ten years previously, they had been bottom of the fourth tier of English football. Hull's form never replicated the highs of the early autumn, with the team winning only two more games over the remainder of the season, but secured their top-flight status on the last day of the season due to other results. On 29 October 2009, chairman Paul Duffen resigned his position with the club, and was replaced by former chairman Adam Pearson on 2 November 2009. On 15 March 2010, manager Phil Brown was put on gardening leave after a run of four defeats left Hull in the relegation zone. Brown's replacement was former Crystal Palace and Charlton boss Iain Dowie, and the appointment was met with some disbelief by supporters who were hoping for a "bigger name" replacement. Hull City's relegation from the Premier League was confirmed on 3 May 2010, after a 2–2 draw at Wigan Athletic. Both Brown and Dowie had their contracts terminated, and Leicester City's Nigel Pearson was confirmed as the new manager. A reported block on player transfers into the club, set in place by the Hull City board on 28 July 2010 until transfers out would substantially reduce the £39 million-per-year wage bill, at first cast doubt on the new manager's efforts to build a squad capable of a quick return to the Premier League; nevertheless, Pearson brought several transfers and loan signings into the club in his bid to strengthen the squad for the season's campaign. The team set a new club record on 12 March 2011 with 14 away matches unbeaten, breaking a previous record held for over 50 years. This 17-match streak was finally broken by Bristol City on the last day of the 2010–11 season, Hull losing the match 3–0. On 15 November 2011, Nigel Pearson left the club to return to Leicester. Nick Barmby was appointed as his successor, but was sacked in May 2012 after publicly criticising the club's owners in an interview given to a local newspaper. In the same month, the club's consultancy agreement with Adam Pearson was terminated. On 8 June 2012, Steve Bruce was appointed manager of the club on a three-year deal, and he guided Hull back to the Premier League by drawing with League champions Cardiff City on the final day of the season. On 13 April 2014, the club reached its first FA Cup Final after defeating Sheffield United 5–3 in the semi-final at Wembley Stadium. Their place in the 2014–15 UEFA Europa League, regardless of whether they won the 2013–14 FA Cup, was confirmed on 3 May as Everton's failure to win meant that Hull's FA Cup Final opponents Arsenal would compete in the 2014–15 UEFA Champions League. Hull City will enter in the third qualifying round, in their first ever European campaign. The FA Cup final on 17 May saw Hull go 2–0 up within the first ten minutes, before losing 3–2 after extra time. On 31 July 2014, Hull made their debut in European competition, in the UEFA Europa League third qualifying round, with a 0–0 draw against Slovakian side FK AS Trenčín before winning the second leg 2–1 a week later. An error from keeper Allan McGregor gave them a 1–0 loss away to Belgian outfit Lokeren in the first leg of their play-off tie on 21 August 2014 with the second leg at home ending in a 2–1 victory, but away goals marked the end of Hull's first foray into European football. In March 2015, Steve Bruce signed a further three-year deal with the club. Hull were relegated from the Premier League after the 2014–15 season, finishing eighteenth with 35 points after a 0–0 draw against Manchester United, along with Newcastle United securing their Premier League Status after beating West Ham United 2–0. In October 2015 Hull beat Leicester City in a penalty-shootout to take them through to their first ever quarter-final appearance in the Football League Cup. On 22 July 2016, the BBC reported that manager Bruce had resigned from his position. This was later confirmed by the club, which also announced that Mike Phelan would act as caretaker manager. On 13 October 2016, Phelan became Hull's permanent head coach. On 3 January 2017, Phelan was sacked by Hull City, less than three months after being made permanent. The decision was made following a 3–1 away defeat to West Bromwich Albion the previous day, leaving the Tigers bottom of the Premier League and three points adrift of safety. On 5 January 2017, the club announced the appointment of Marco Silva as the new head coach until the end of the 2016–17 season. On 25 May 2017, following relegation from the Premier League, manager Marco Silva resigned. On 9 June 2017, the club announced the appointment of Leonid Slutsky as head coach. On 3 December 2017, Leonid Slutsky and Oleg Yarovinsky left the club by mutual consent after a run of bad results. On 7 December 2017, Nigel Adkins was appointed as head coach on an 18-month contract  and Andy Crosby was appointed as his assistant. In August 2013, owner Assem Allam announced that the club has re-registered as "Hull City Tigers Ltd," and that the team would be marketed as "Hull City Tigers," removing the "Association Football Club" that had been part of the name since the club's formation in 1904. Vice-chairman Ehab Allam said "AFC" would remain on the club badge for the 2013–14 season, but removed the “AFC” after . In response, a Premier League spokesman said, "We have not been informed of a change in the name of the actual club. They will still be known as Hull City as far as the Premier League is concerned when results or fixtures are published." According to its chairman, by 2014, the club would be further renamed "Hull Tigers," because, as he claimed, "in marketing, the shorter the name the more powerful [it is]," while "Association Football Club" made the name too long. Allam stated he dislikes the word "City", as it is too "common" and a "lousy identity", since it is associated also with other clubs, such as Leicester City, Bristol City and Manchester City. He told David Conn of The Guardian that "in a few years many clubs will follow and change their names to something more interesting and I will have proved I am a leader," adding that if he were the owner of Manchester City, he would change their name to "Manchester Hunter." Allam justified the intended name change as part of his plans to create "additional sources of revenue" for the club, after Hull City Council refused to sell him the stadium freehold so he could develop, as he had stated, "a sports park" on the site. The council has refused to sell in order, as they stated, "to preserve the annual Hull Fair held on the adjacent car park." After the collapse of the negotiations, Allam stated: "I had in mind £30 million to spend on the infrastructure of the club, to increase the stadium by 10,000 and to have commercial activities around the stadium — cafeterias, shops, supermarkets — to have all this to create income for the club so that in the future it can be self-financing and not relying on me." He asked rhetorically, "What if I dropped dead tomorrow?" Supporters' groups expressed opposition to the name change. Bernard Noble, chairman of Hull City's official supporters club said he was disappointed, although he agreed that Allam had saved the club from liquidation and that it was "his club". Blogger Rick Skelton called the name change "a pointless exercise" and said, "Mr Allam's assertion that the name 'Hull City' is irrelevant and too common, is as disgusting a use of the English language as his new name for the club." Before the first home match of the season on 24 August 2013, a group of supporters marched in protest against the name change, and unfurled a banner that read, "Hull City AFC: a club not a brand". Allam dismissed complaints by the fans, stating "nobody questions my decisions in my business." In a comment published on 1 December 2013 in The Independent in response to supporters' chants and banners of "City Till (sic) We Die", Allam said, "They can die as soon as they want, as long as they leave the club for the majority who just want to watch good football." The supporters responded with chants of "We're Hull City, we'll die when we want" during that day's home match against Liverpool. Manager Steve Bruce credited the controversy for creating " a fantastic atmosphere" but added, "I have got to have a conversation with him because I don't think he quite understands what it means in terms of history and tradition." However, Bruce also said that, because of the money Allam had invested in the club, "If he thinks Hull Tigers is his way forward then we have to respect it." On 11 December 2013, a spokesman for Hull City announced that the club had formally applied to the Football Association to have its name changed to "Hull Tigers" from the 2014–15 season onwards. The FA Council, which has "absolute discretion" in deciding whether to approve the plan or not, stated the next day that it would follow a "consultation process" with stakeholders, "including the club's supporter groups." Some brand and marketing experts have come out in support of the name change. Nigel Currie, director of sports marketing agency Brand Rapport, stated that "the whole process has been conducted badly with the supporters, but [the name change] is a pretty sound idea." Simon Chadwick, professor of Sport Business Strategy and Marketing at the Coventry University Business School, opined that the objective of opening up lucrative new markets for shirt sales, merchandise and broadcast deals shows commercial vision and could bring benefits, but "this needs to be backed up by a proper marketing strategy and investment." He said, "it's no use thinking changing the name or the colour of the shirt will pay instant dividends." David Stern, commissioner of the National Basketball Association in the United States, warned: "I would say a wise owner [of a sports club] would view his ownership as something of a public trust, in addition to the profit motive, and you really do want to allow the fans a little bit more input than I think is being allowed, with respect to Hull." On 17 March 2014, the FA membership committee advised that the name change application be rejected at the FA Council meeting on 9 April. In response, the club published a statement saying the FA was "prejudiced" and criticised the committee's consultation with the City Till We Die opposition group. The following week, the club opened a ballot of season ticket holders over the name change. Opponents of the name change criticised as "loaded" the questions, which asked respondents to choose between "Yes to Hull Tigers with the Allam family continuing to lead the club", "No to Hull Tigers" and "I am not too concerned and will continue to support the club either way", on the grounds that voters were not given the option to reject the name while keeping the Allam family as owners. Of 15,033 season ticket holders, 5,874 voted in all, with 2,565 voting in favour of the change and 2,517 against, while 792 chose the "not too concerned" option. On 9 April 2014, the FA Council announced its decision, carried by a 63.5% vote of its members, to reject the club's application for a name change. The club responded by stating it will appeal the decision. However, since there is no appeal process with the FA and its Council, the decision is final. On 11 September 2014, Allam confirmed an appeal has been submitted to the Court of Arbitration for Sport. He also held a news conference confirming the club had been put up for sale due to the English FA's decision on 9 April 2014. In October 2014, interviewed by the BBC, Allam confirmed that he would "not invest a penny more in the club" unless he is allowed to change the club's name to Hull Tigers. In the same interview, Allam said, "I have never been a football fan. I am still not a football fan. I am a community fan." In March 2015, an independent panel appointed by the Court of Arbitration for Sport ruled that the decision of the Football Association Council to block the name change "cannot stand" on account of the process having been "flawed." In July 2015, the Football Supporters Federation confirmed that a 70/30 decision was made in favour of Hull City A.F.C. not changing their name after an FA vote. Greg Dyke, chairman of the FA, reportedly voted yes to a change. For most of the club's history, Hull have worn black and amber shirts with black shorts. These black and amber colours are where Hull's nickname, The Tigers, originated from. However, in the club's first match against Notts County in 1904, white shirts were worn, with black shorts and black socks. During their first season in the League, Hull wore black and amber striped shirts and black shorts, which they continued to wear until the Second World War with the exception of the 1935–36 season, in which they wore sky blue shirts. Following the end of the Second World War, Hull spent another season wearing sky blue, but changed to plain amber shirts, which they wore until the early 1960s, when they swapped back to stripes. During the mid-1970s, and early 1980s, the strip was constantly changing between the two versions of plain shirts and stripes. During the late 1980s, red was added to the kits but its duration went no further than this. The early 1990s featured two "tiger skin" designs, which have since featured in several articles listing the "worst ever" football kits. The 1998–99 season introduced a kit with cross-fading amber and white stripes, another experiment that proved unpopular. After the start of the 21st century, the club wore plain amber shirts until 2004, when the club celebrated its centenary by wearing a kit similar to the design of the one worn 100 years ago. In 1935, Hull City's first shirt badge mirrored the familiar three crowns civic emblem of Kingston-upon-Hull, which was displayed on the sky blue shirts worn in the 1935–36 season. Following that season, the team went without wearing a badge until 1947, when the club crest depicted a tiger's head in an orange-shaded badge. This was worn up until 1957, when it was changed to just the tiger's head. This was worn for three years, when the shirt again featured no emblem. Then, in 1971, the club returned to showing the tiger's head on the shirt. This was used for four years, until the club's initials of HCAFC were shown for four years. After this, a logo with the tiger's head with the club's name underneath was used from 1979 until 1998. The next logo, which remains the club's current logo, features the tiger's head in an amber shield with the club's name, along with the club's nickname, The Tigers. Hull changed their crest in June 2014, becoming one of few English league teams without the club name on their crest. Between 1904 and 1905, Hull City played their home games at the Boulevard. This ground was used by Hull on a contract which allowed them to use it when not used for Rugby League, at a cost of £100 per annum. Hull built their own ground, Anlaby Road, which was opened in 1906. With the threat of the rerouting of the railway line through the Anlaby Road ground, the club was convinced it needed to secure its future by owning its own ground. They negotiated the deal for land between Boothferry Road and North Road in 1929, which was financed by a £3,000 loan from the FA. Due to the club's financial difficulties, no work took place for three years, and development then stopped until 1939. In that year a proposal to build a new multi-purpose sports stadium on the site temporarily halted the club's plans to relocate, but when this plan failed the club resolved to continue with the stalled development of the site, in anticipation of moving to the new stadium in 1940. The outbreak of war, however, meant that the redevelopment again came to a halt, as the site was taken over by the Home Guard. During the Second World War, Anlaby Road was damaged by enemy bombing, the repair cost of which was in the region of £1,000. The Cricket Club served notice to quit at the same time, and so in 1943 the tenancy was officially ended. Hull were forced to return to the Boulevard Ground from 1944 until 1945 because of the poor condition of the planned stadium at Boothferry Road. The new stadium was finally opened under the revised name of Boothferry Park on 31 August 1946. Hull City, along with one of the city's rugby league sides, Hull F.C., moved into the newly built KC Stadium in 2002. The KC Stadium was named "Best Ground" at the 2006 Football League Awards. In the club's annual report for the 12-month period up to 31 July 2009, auditors Deloitte stated that £4.4 million had gone out of the club and stadium company to owner Russell Bartlett's holding companies in loans, while at least £2.9 million of it was used in the take-over itself of the club. A further £560,000 was paid, according to the audit, by the stadium company to Bartlett's holding companies in "management fees," while at least £1 million was owed to him personally as a "salary." After the warning from	Deloitte, Bartlett gave the club a £4 million loan, "which	brought	the money he had taken out and put in since taking over to about even." On an "Opacity Score" of 100, where zero indicates complete openness and 100 complete secrecy, the company which owns the club has been rated by Christian Aid at 87. Hull City's corporate accounts, as of July 2013[update], show a £25.6 million loss, on revenues of £11 million, after player and management costs of "just under £23 million." The club has "future tax losses" available of more than £45 million. Another Assam Allam company, Allam Marine, also wholly owned by Allamhouse Limited, revealed in its 2012 accounts that "utilisation of tax losses from group companies" reduced its tax liability by £3.8 million over 2011 and 2012. As reported, HM Revenue and Customs are in the process of an inquiry at Hull City AFC, as part of the British tax authorities' targeting of football clubs over "tax-free payments to players under image rights' deals and the provision of benefits in kind. For Hull City AFC, the provision for benefits in kind was reported at £682,000 as of July 2011, growing to £810,000 by July 2012. Andy Davidson holds the record for Hull City league appearances, having played 579 matches. Garreth Roberts comes second, having played 487 matches. Chris Chilton is the club's top goalscorer with 222 goals in all competitions; Chilton also holds the club record for goals scored in the League (193), FA Cup (16) and League Cup (10). The club's widest victory margin in the league was their 11–1 win against Carlisle United in the Third Division North on 14 January 1939. Their biggest win in the top flight was achieved on 28 December 2013, with a 6–0 victory over Fulham. Their heaviest defeat in the league was 8–0 against Wolverhampton Wanderers in 1911. Their heaviest top flight defeat was a 7–1 defeat to Tottenham Hotspur on 21 May 2017. Hull City's record home attendance is 55,019, for a match against Manchester United on 26 February 1949 at Boothferry Park, with their highest attendance at their current stadium, the KC Stadium, 25,030 set on 9 May 2010 against Liverpool for the last match of the season. The highest transfer fee received for a Hull City player is £12.5 million from Southampton for Shane Long. The highest transfer fee paid for a player is for Abel Hernández from Italian side Palermo, for a fee reported to be approximately £9.5 million. As of 23 April 2019. Only professional, competitive matches are counted. As of 26 January 2018. Hull City Reserves play in the Reserve League East Division. The team plays home fixtures at the Church Road Ground, home of North Ferriby United. Hull City Juniors play in the Football League Youth Alliance, playing their home fixtures at Winterton Rangers' home stadium. Main article: Hull City Women A.F.C. Hull City Women play in the Northern Combination Women's Football League. In the 2006–07 season, the team finished seventh in the table with 33 points. According to a 2003 poll, Hull City fans consider their main rival to be Yorkshire neighbours Leeds United. The club also has a traditional rivalry with Sheffield United. In 1984, Sheffield United won promotion at Hull City's expense with the teams level on points and goal difference and separated only by goals scored, with 33 of United's goals scored by former Hull City striker Keith Edwards. City's final game of the season against Burnley had been rescheduled due to bad weather and took place after their promotion rivals had finished their campaign; Hull went into the game knowing that a three-goal victory would mean promotion, but in front of a crowd which included a number of United fans could manage only a 2–0 win, ensuring that United went up instead. Distant rivals include teams from across the Humber Estuary in Lincolnshire, Scunthorpe United and Grimsby Town. With Scunthorpe's promotion from League One, the 2007–08 Championship season saw the return of a "Humber Derby". Additionally, Lincoln City and non-league York City are said to consider Hull amongst their rivals. The club's main hooligan firm appears to be the Hull City Psychos,  dating back to the 1960s. ^ "EFL Official Website - Hull City". EFL. 3 January 2019. Retrieved 3 January 2019. ^ "Hull fight back to reach FA Cup final". BBC Sport. Retrieved 13 April 2014. ^ a b c "1904–1915: The Formative Years". Hull City Mad. Digital Sports Group. 2 January 2002. Retrieved 11 July 2011. ^ a b "Hull City". Historical Football Kits. Dave Moor. Retrieved 19 September 2017. ^ a b c d e f g h i j "History of the Tigers". Hull City A.F.C. 10 May 2011. Archived from the original on 18 July 2011. Retrieved 25 November 2012. ^ a b c Peterson, Mike (1999). The Definitive Hull City A.F.C. : A statistical history to 1999. Tony Brown. p. 13. ISBN 1-899468-13-7. ^ a b c d e f g h i j k l "Hull City". Football Club History Database. Richard Rundle. Retrieved 19 September 2017. ^ "Grimsby fish market to open over festive period". FISHupdate. Wyvex Media Limited. 21 December 2006. Archived from the original on 7 June 2012. Retrieved 17 July 2016. ^ "1919–1939: Inter War Promise Not Fulfilled". Hull City Mad. Digital Sports Group. 2 January 2002. Retrieved 26 February 2011. ^ a b c d e f Beill, Andy (6 November 2007). "Boothferry Park". Hull City Mad. Digital Sports Group. Retrieved 26 February 2011. ^ "1939–1961: The Carter Era and Beyond". Hull City Mad. Digital Sports Group. 2 January 2002. Retrieved 26 February 2011. ^ "1961–1980: Rising under Britton then Decline". Hull City Mad. Digital Sports Group. 2 January 2002. Retrieved 26 February 2011. ^ Ingle, Sean; Murray, Scott (10 January 2002). "Shooting from the hip". The Guardian. Retrieved 11 July 2011. ^ a b "Club Profile". Premier League. Retrieved 11 July 2011. ^ "1980–1997: Robinson the Saviour – Boring, Boring Dolan". Hull City Mad. Digital Sports Group. 2 January 2002. Retrieved 26 February 2011. ^ a b "1997–2000: Saved? and Future Prospects". Hull City Mad. Digital Sports Group. 2 January 2002. Retrieved 26 February 2011. ^ "Following Tigers through thick and mainly thin finally pays off". The Yorkshire Post. 24 May 2008. Retrieved 11 July 2011. ^ a b "Hull part company with Parkinson". BBC Sport. 4 December 2006. Retrieved 11 July 2011. ^ "Hull unveil Brown as new manager". BBC Sport. 4 January 2007. Retrieved 11 July 2011. ^ "Hull capture Windass in loan deal". BBC Sport. 17 January 2007. Retrieved 11 July 2011. ^ "Deano's Back!". Hull City A.F.C. 19 June 2007. Archived from the original on 2 September 2012. Retrieved 11 July 2011. ^ "Statement from Adam Pearson". Hull City A.F.C. 15 June 2007. Archived from the original on 2 September 2012. Retrieved 11 July 2011. ^ McNulty, Phil (14 May 2008). "Hull 4–1 Watford (agg 6–1)". BBC Sport. Retrieved 11 July 2011. ^ McNulty, Phil (24 May 2008). "Bristol City 0–1 Hull". BBC Sport. Retrieved 24 May 2008. ^ "The wait ends for Lyon and Hull". FIFA. 28 May 2008. Archived from the original on 12 November 2012. Retrieved 11 July 2011. ^ "Barclays Premier League – Updated 25/10/2008". Hull City A.F.C. Archived from the original on 16 March 2009. Retrieved 3 November 2008. ^ "Brown hails 'biggest' day – updated 24/05/2009". Sky Sports. 24 May 2009. Retrieved 25 May 2009. ^ "Hull chairman Duffen steps down". BBC Sport. 29 October 2009. Retrieved 11 July 2011. ^ "Club Statement". Hull City A.F.C. 2 November 2009. Archived from the original on 1 March 2012. Retrieved 2 November 2009. ^ "Hull City relieve manager Phil Brown of his duties". BBC Sport. 15 March 2010. Retrieved 11 July 2011. ^ "Wigan draw relegates Hull". Sky Sports. 3 May 2010. Retrieved 5 May 2010. ^ "Club Statement". Hull City A.F.C. 7 June 2010. Archived from the original on 14 March 2012. Retrieved 7 June 2010. ^ "Hull City: Dowie's been told thanks, but no thanks after poor Premier League record". Hull Daily Mail. 19 June 2010. Archived from the original on 3 May 2012. Retrieved 11 July 2011. ^ "Tigers Name New boss". Hull City A.F.C. 29 June 2010. Archived from the original on 14 March 2012. Retrieved 29 June 2010. ^ "Hull City: Tigers tempted Nigel Pearson with ambitious plans". Hull Daily Mail. 29 June 2010. Archived from the original on 3 May 2012. Retrieved 11 July 2010. ^ "Hull ban new arrivals". The Sun. 28 July 2010. Retrieved 28 July 2010. ^ "Hull City secure Spurs youngster John Bostock on loan". BBC Sport. 6 August 2010. Retrieved 11 July 2011. ^ "Tigers bring in Koren". Hull City A.F.C. 13 August 2010. Archived from the original on 15 August 2010. Retrieved 13 August 2010. ^ "Coventry 0 – 1 Hull". BBC Sport. 12 March 2011. Retrieved 11 July 2011. ^ "Bristol City 3 – 0 Hull". BBC Sport. 7 May 2011. Retrieved 29 September 2011. ^ "Leicester City appoint Hull City's Nigel Pearson as boss". BBC Sport. 15 November 2011. Retrieved 15 November 2011. ^ "Hull City appoint Nick Barmby as manager". BBC Sport. 10 January 2012. Retrieved 10 January 2012. ^ "Hull City sack manager Nick Barmby". BBC Sport. 8 May 2012. Retrieved 12 May 2012. ^ "Official Statement". Hull City A.F.C. 1 May 2012. Archived from the original on 7 May 2012. Retrieved 1 May 2012. ^ "Steve Bruce appointed Hull City manager on three-year deal". BBC Sport. 8 June 2012. Retrieved 12 June 2012. ^ "Hull 2 – 2 Cardiff". BBC Sport. 4 May 2013. Retrieved 13 May 2013. ^ "Watford 1 – 2 Leeds United". BBC Sport. 4 May 2013. Retrieved 13 May 2013. ^ "Hull City 5–3 Sheff Utd". Sky Sports. 13 April 2014. Retrieved 14 April 2014. ^ Reid, Jamie (17 May 2014). "Aaron Ramsey steers Arsenal to victory in epic FA Cup Final". The Football Association. Retrieved 17 May 2014. ^ "AS Trencin 0–0 Hull City". BBC Sport. 31 July 2014. Retrieved 31 July 2014. ^ "Hull 2 – 1 AS Trenčín". BBC Sport. 7 August 2014. Retrieved 17 June 2015. ^ "KSC Lokeren 1 – 0 Hull". BBC Sport. 21 August 2014. Retrieved 17 June 2015. ^ "Bruce Agrees New Deal". Hull City A.F.C. 11 March 2015. Archived from the original on 2 April 2015. Retrieved 12 March 2015. ^ "Steve Bruce confirms signing new three-year deal with Hull City". BBC Sport. 13 March 2015. Retrieved 13 March 2015. ^ "Hull 0–0 Manchester United: Steve Bruce's men suffer final-day relegation". Sky Sports. 25 May 2015. Retrieved 17 June 2015. ^ "Bruce Delighted To Take Tigers Through". Hull City A.F.C. 27 October 2015. Archived from the original on 8 December 2015. Retrieved 27 October 2015. ^ "Hull 1–1 Leicester". BBC Sport. 27 October 2015. Retrieved 27 October 2015. ^ "Club Statement". Hull City A.F.C. 22 July 2016. Archived from the original on 18 August 2016. Retrieved 23 July 2016. ^ "Hull City: Mike Phelan named full-time head coach". BBC Sport. 13 October 2016. Retrieved 13 October 2016. ^ "Struggling Hull Sack Manager Phelan". BBC Sport. 3 January 2017. Retrieved 3 January 2017. ^ "Tigers Appoint Marco Silva As New Head Coach". Hull City A.F.C. 5 January 2017. Archived from the original on 6 January 2017. Retrieved 5 January 2017. ^ "Marco Silva: Hull City manager resigns after the club's relegation". BBC Sport. 25 May 2017. Retrieved 3 June 2017. ^ "Tigers Confirm Leonid Slutsky As Head Coach". Hull City A.F.C. 9 June 2017. Archived from the original on 9 June 2017. Retrieved 9 June 2017. ^ "Slutsky Departs By Mutual Consent". Hull City A.F.C. season. 3 December 2017. Retrieved 3 December 2017. ^ "Nigel Adkins: Hull City appoint former Southampton and Reading boss". BBC Sport. BBC. 7 December 2017. Retrieved 7 December 2017. ^ "Tigers Appoint Nigel Adkins". Hull City A.F.C. 7 December 2017. Retrieved 7 December 2017. ^ "Hull City to be renamed as Hull City Tigers 'to strengthen identity'". Press Association. 9 August 2013. Retrieved 18 January 2014. ^ a b Campbell, James (26 August 2013). "Hull City protesters: 'Our banner will be at every game'". Hull Daily Mail. Archived from the original on 19 October 2013. Retrieved 18 January 2014. ^ a b c Conn, David (12 September 2013). "Assem Allam courts controversy and hands Hull City an identity crisis". The Guardian. Retrieved 2 December 2013. ^ "Hull City: Tigers chairman dismisses fans' protests". BBC Sport. 12 November 2013. Retrieved 18 January 2014. ^ "Hull owner Assem Allam: Critics 'can die as soon as they want'". BBC Sport. 1 December 2013. Retrieved 2 December 2013. ^ Hunter, Andy (1 December 2013). "Steve Bruce admits threat of rebranding makes Hull City burn bright". The Guardian. Retrieved 2 December 2013. ^ "Hull City formally apply to FA for name change to Hull Tigers". Press Association. 11 December 2013. Retrieved 13 December 2013. 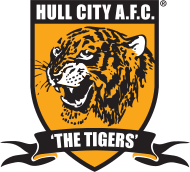 ^ "Hull City: Hull Tigers name change submitted to FA". BBC Sport. 11 December 2013. Retrieved 18 January 2014. ^ Conn, David (12 December 2013). "FA to consult Hull City fan groups before considering Tigers name change". The Guardian. Retrieved 13 December 2013. ^ a b c "Could Assem Allam's Tigers name change benefit club?". BBC Sport. 16 January 2014. Retrieved 18 January 2014. ^ "Hull City: FA set to reject name change to Hull Tigers". BBC Sport. 17 March 2014. Retrieved 17 March 2014. ^ "Hull City accuse FA of 'prejudice' over bid to change name to Tigers". Press Association. 18 March 2014. Retrieved 26 March 2014. ^ "Hull City 'Tigers' ballot: Fans' group says 'loaded' question will skew result". Hull Daily Mail. 22 March 2014. Archived from the original on 26 March 2014. Retrieved 26 March 2014. ^ "Hull City: Fans narrowly back Tigers name change in ballot". BBC Sport. 7 April 2014. Retrieved 8 April 2014. ^ a b "Hull City: FA Council rejects proposed name change to Tigers". BBC Sport. 9 April 2014. Retrieved 9 April 2014. ^ "Hull City: Owner Assem Allam says club put up for sale". BBC Sport. 11 September 2014. Retrieved 11 September 2014. ^ a b "Assem Allam: Hull City owner prepared to stop spending". BBC Sport. 3 October 2014. Retrieved 29 March 2014. ^ "Hull City told they can reapply for Tigers name change". BBC Sport. 16 March 2015. Retrieved 17 March 2015. ^ "Hull City lose FA vote to change name to Tigers for the second time". BBC Sport. 11 July 2015. Retrieved 11 July 2015. ^ Nicholson, John; Beill, Andy (4 January 2005). "1904–1939". Hull City Mad. Digital Sports Group. Retrieved 26 February 2011. ^ Nicholson, John; Beill, Andy (4 January 2005). "1945–1968". Hull City Mad. Digital Sports Group. Retrieved 26 February 2011. ^ Nicholson, John; Beill, Andy (30 May 2005). "1968–1990". Hull City Mad. Digital Sports Group. Retrieved 26 February 2011. ^ Nicholson, John; Beill, Andy (4 January 2005). "1990–2000". Hull City Mad. Digital Sports Group. Retrieved 26 February 2011. ^ Nicholson, John; Beill, Andy (13 August 2009). "2000 – present day". Hull City Mad. Digital Sports Group. Retrieved 26 February 2011. ^ "Hull City Announce Umbro Kit Deal". Hull City A.F.C. 20 April 2014. Archived from the original on 21 May 2014. Retrieved 21 May 2014. ^ "Tigers Announce New Shirt Sponsor". Hull City A.F.C. 10 July 2015. Archived from the original on 12 July 2015. Retrieved 10 July 2015. ^ "Hull City & SportPesa Extend Partnership For Further Season". Hull City A.F.C. 4 March 2019. Retrieved 4 March 2019. ^ a b Beill, Andy (5 November 2004). "The Boulevard". Hull City Mad. Digital Sports Group. Retrieved 26 February 2011. ^ a b Beill, Andy (5 November 2004). "Anlaby Road". Hull City Mad. Digital Sports Group. Retrieved 26 February 2011. ^ "A History of Boothferry Park". Hull City A.F.C. 27 May 2010. Archived from the original on 13 February 2010. Retrieved 11 July 2011. ^ "Prestigious Award for The KC Stadium". Archived from the original on 8 January 2008. Retrieved 4 September 2009. ^ a b c d e "Blowing the whistle: Time's up for financial secrecy" (PDF). Christian Aid. May 2010. Retrieved 26 January 2014. ^ Conn, David (31 March 2010). "Hull City owner Russell Bartlett trades £4m loan deals with the club". The Guardian. Retrieved 26 January 2014. ^ "Allamhouse Limited profile". CompanyCheck. Retrieved 26 January 2014. ^ "Allamhouse Lts legal information". CompaniesInTheUK. Retrieved 26 January 2014. ^ "Who's Who at the KC". Hull City A.F.C. Archived from the original on 26 June 2014. Retrieved 26 January 2014. ^ a b c d e "Planet Football: Hull City". Private Eye (#1355): p. 33. December 2013. ^ a b c d Peterson. The Definitive Hull City A.F.C. : A statistical history to 1999. p. 5. ^ "Liverpool 6–1 Hull". BBC Sport. 28 December 2013. Retrieved 28 December 2013. ^ "Find out about Hull City Football Club". BBC Where I Live Humber. BBC. Archived from the original on 8 November 2012. Retrieved 12 October 2014. ^ Bysouth, Alex (21 May 2017). "Hull City 1–7 Tottenham Hotspur". BBC Sport. Retrieved 5 September 2018. ^ Reekie, Harry (9 May 2010). "Hull 0 – 0 Liverpool". BBC Sport. Retrieved 11 July 2011. ^ "Shane Long Southampton deal confirmed: Leaves Hull City for 'undisclosed fee'". Hull Daily Mail. Archived from the original on 16 August 2014. Retrieved 16 August 2014. ^ "Hull City Complete Club Record Signing". Hull City A.F.C. 1 September 2014. Archived from the original on 3 September 2014. Retrieved 12 October 2014. ^ "Premier League: Hull City record signing Abel Hernandez turned down Benfica offer". Sky Sports. 11 September 2014. Retrieved 12 October 2014. ^ "First team". Hull City A.F.C. Retrieved 18 July 2018. ^ "George Long: Hull City sign Sheffield United goalkeeper for an undisclosed fee". BBC Sport. 18 July 2018. Retrieved 18 July 2018. ^ "Henriksen Honoured To Be Named Captain". Hull City A.F.C. 1 August 2018. Retrieved 1 August 2018. ^ "2018/19 Squad Numbers Released". Hull City A.F.C. Retrieved 2 August 2018. ^ "Goalkeeper Burton Joins Chesterfield On Loan". Hull City A.F.C. 24 August 2018. Retrieved 25 August 2018. ^ "Marc Pugh Joins Hull On Loan". A.F.C. Bournemouth. 22 January 2019. Retrieved 22 January 2019. ^ "Liam Ridgewell: Hull City sign veteran defender until end of the season". BBC Sport. BBC. 31 January 2019. Retrieved 31 January 2019. ^ Beill, Andy (27 August 2002). "Greaves Goes". Hull City Mad. Digital Sports Group. Retrieved 1 April 2013. ^ "Who were the winners at our official awards evening?". Hull City A.F.C. 20 April 2013. Archived from the original on 22 April 2013. Retrieved 21 April 2013. ^ "Davies Scoops Top Prize". Hull City A.F.C. 7 May 2014. Archived from the original on 8 May 2014. Retrieved 7 May 2014. ^ "Michael Dawson named Hull City's Player of the Year by Mail readers". Hull Daily Mail. 3 May 2015. Archived from the original on 8 May 2015. Retrieved 5 June 2016. ^ "Hernandez at the Double at Player of the Season Awards". Hull City A.F.C. 3 May 2016. Archived from the original on 4 May 2016. Retrieved 7 May 2016. ^ "Bowen Bags A Brace At Player Of The Year Awards Evening". Hull City A.F.C. 8 May 2018. Retrieved 12 May 2018. ^ "Hull: Managers". Soccerbase. Centurycomm. Retrieved 19 September 2017. ^ "Richardson Named As New Goalkeeping Coach". Hull City A.F.C. 26 January 2018. Retrieved 26 January 2018. ^ a b "Hull City AFC Reserves 2010/11". Hull City A.F.C. 5 May 2011. Archived from the original on 9 January 2012. Retrieved 11 July 2011. ^ "Juniors". Hull City A.F.C. Retrieved 19 June 2007. ^ "Hull City Ladies". Hull City A.F.C. 17 May 2007. Retrieved 19 June 2007. ^ a b c "Rivalry Uncovered!" (PDF). Football Fans Census. Archived from the original (PDF) on 4 March 2009. Retrieved 15 July 2007. ^ "Hull City Online Vote Interactive". Hull City Mad. Digital Sports Group. Archived from the original on 27 September 2007. Retrieved 19 July 2007. ^ "League Tables". Blades Mad. Digital Sports Group. Retrieved 16 July 2007. ^ "Tigers suffered turf moor heartache". Hull Daily Mail. 2 May 2008. Retrieved 11 July 2011. ^ "It is often thought that promoted clubs begin the following season on a high with the same buoyancy, spirit and togetherness providing a knock-on effect". Hull Daily Mail. 8 April 2000. Retrieved 11 July 2011. ^ "Trio to miss Humber derby". Scunthorpe United F.C. 21 November 2007. Archived from the original on 4 April 2012. Retrieved 11 July 2011. ^ Nicholls, Andy; Lowles, Nick (September 2005). Hooligans: The A-L of Britain's Football Hooligan Gangs. Wrea Green: Milo Books. p. 272. ISBN 1-903854-41-5. Wikimedia Commons has media related to Hull City A.F.C..